It’s all a bit thrilling to see the doors of the Canadian government opening again, and a progressive and diverse Cabinet, with doctors, social workers, and human rights advocates, with science and climate change so front and centre, with so many women who are deeply familiar with the realities of poverty, with such a commitment to youth and real change, not to mention two Indigenous Cabinet Ministers, one who is in charge of the law of the land. Wow! And there are many other people in Cabinet and in Parliament who also care about good food, and realize how critical it is to achieve our environmental, economic and social goals. This wave of hope and possibility has become so palpable in Ottawa, in contrast to the deep dark reality of public life over the past decade: no debate, no consultation, no funding, no meaningful engagement with First Nations, precious little media access, international shame. This week I attended the Canadian Agri-Food Policy Institute’s Conference in Ottawa which was examining the question of trust and our food system. Farmers, food businesses, and policy makers were all wrestling with the issue of how to ensure that Canada’s food system is trusted, viable and sustainable and up to the challenges that lie ahead. Speakers ranged from the President of Chinese e-commerce giant Alibaba and Maple Leaf Foods CEO to those running small healthy food innovative business and advocates for more local and healthy food in schools. 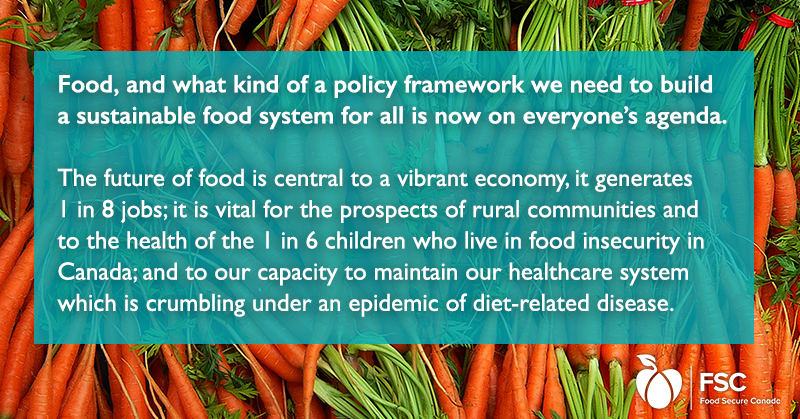 Food, and what kind of a policy framework we need to build a sustainable food system for all is now on everyone’s agenda. The future of food is central to a vibrant economy, it generates 1 in 8 jobs; it is vital for the prospects of rural communities and to the health of the 1 in 6 children who live in food insecurity in Canada; and to our capacity to maintain our healthcare system which is crumbling under an epidemic of diet-related disease. Cities and provinces are innovating with legislation, food policy councils, urban agriculture, food charters, policies and roadmaps to begin to deliver to Canadians to kind of fresh, local, sustainable, affordable food they want and now is the time for the new Liberal Government to follow through on their commitment to develop and fund a national food strategy to reduce food insecurity in Canada (see Box). The hard work to forge a progressive food policy in Canada that meets the needs of farmers, low-income people and responds to the imperatives of public health and climate change lies ahead. 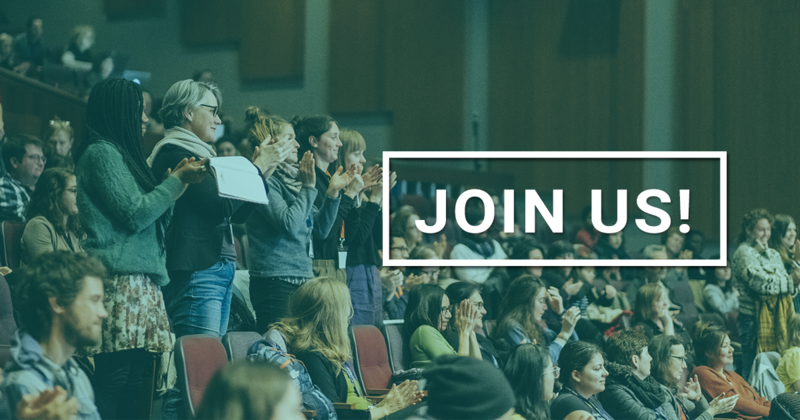 Food Secure Canada will be hosting an open dialogue Next Steps for Food Policy November 15th looking at the most strategic ways to ensure that this Government’s commitment to real change encompasses a more fair, sustainable and healthy food system. Please join us in the dialogue in Montreal! "A Liberal government is committed to addressing food security in Canada. We support developing and funding a national strategy to reduce food insecurity in Canada. Access to sufficient, safe, healthy, adequate food is a fundamental human right. 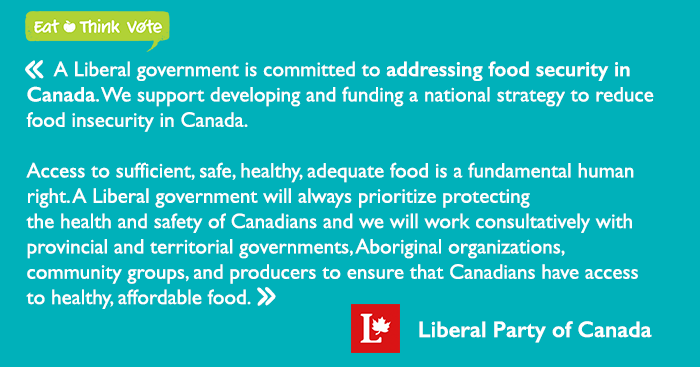 A Liberal government will always prioritize protecting the health and safety of Canadians and we will work consultatively with provincial and territorial governments, Aboriginal organizations, community groups, and producers to ensure that Canadians have access to healthy, affordable food. Liberals understand the fundamental role that the not-for-profit sector and civil society play in both policy development and program delivery. A Liberal government will work in partnership with organizations such as yours to explore more effective solutions to the most pressing challenges facing Canada and Canadians and use your valuable and hands on experience and expertise to determine the best solutions for the good of Canadians. Further, we will ensure that civil society organizations have access to the information you need in order to better advocate the government and other organizations on the needs of Canadians. We will make Statistics Canada fully independent with a mandate to collect data needed by the private sector, other orders of government, not-for-profits, and researchers, in order to support good decision-making. We will consult broadly and work with a strengthened Statistics Canada to make available additional data needed by businesses, municipalities, the not-for-profit sector, and the public. This would include more detailed labour market information, child development data, and statistics on natural capital. 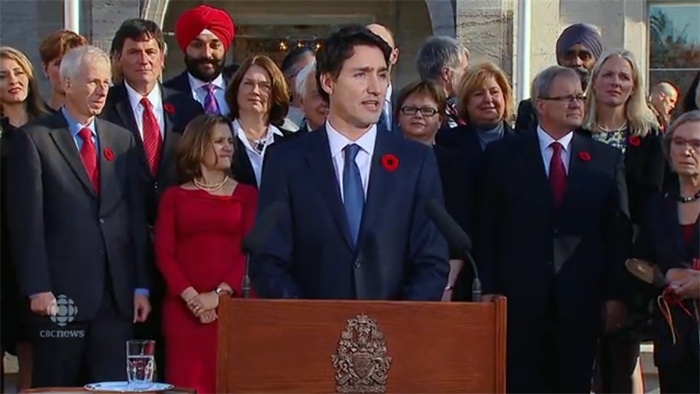 We will also immediately restore the mandatory long-form census."